I am a research geophysicist at the Earthquake Science Center. In my research, I use statistical models and tests to characterize earthquake rate changes in catalogs and the processes that trigger them, both natural (e.g., slow slip or dike intrusions) and manmade (e.g., wastewater fluid injection). I am also interested in the impacts these variations have on short-term earthquake forecasts as well as longer term seismic hazard. Recent study areas include Oklahoma, Arkansas, the central and eastern US, Long Valley Caldera, and the Salton Trough in southern California. 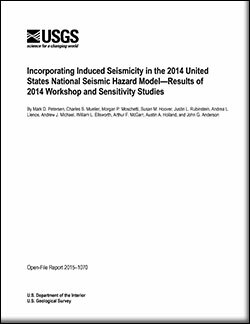 Prior to the USGS, I worked as a postdoctoral scholar at Stanford University, modeling time-dependent dike propagation by jointly inverting seismicity and deformation data. Reviewer for NSF proposals, Journal of Geophysical Research, Geophysical Research Letters, Geophysical Journal International, Bulletin of the Seismological Society of America, Seismological Research Letters, Earth and Planetary Science Letters, Tectonophysics, Physical Review Leters, Science, Science Advances, Nature Geoscience, Earth Planets Space, Acta geodynamica et geomateria, International Journal of Earth Sciences, Science China Earth Sciences, Geofluids, Advances in Geophysics, Journal of Seismology, AGU Books, GSA Books. Petersen, Mark D.; Mueller, Charles; Moschetti, Morgan P.; Hoover, Susan M.; Rukstales, Kenneth S.; McNamara, Daniel E.; Williams, Robert A.; Shumway, Allison; Powers, Peter M.; Earle, Paul; Llenos, Andrea L.; Michael, Andrew J.; Rubinstein, Justin L.; Norbeck, Jack; Cochran, Elizabeth S.
Llenos, Andrea L.; Michael, Andrew J.
Llenos, A. L., and A. J. Michael (2017), Forecasting the (un)productivity of the 2014 M 6.0 South Napa aftershock sequence, Seismol. Res. Lett., doi: 10.1785/0220170050. Petersen, Mark D.; Mueller, Charles; Moschetti, Morgan P.; Hoover, Susan M.; Shumway, Allison; McNamara, Daniel E.; Williams, Robert; Llenos, Andrea L.; Ellsworth, William L.; Rubinstein, Justin L.; McGarr, Arthur F.; Rukstales, Kenneth S.
Petersen, Mark D.; Mueller, Charles; Moschetti, Morgan P.; Hoover, Susan M.; Llenos, Andrea L.; Ellsworth, William L.; Michael, Andrew J.; Rubinstein, Justin L.; McGarr, Arthur F.; Rukstales, Kenneth S.
Llenos, A. L., and A. J. Michael (2016), Characterizing potentially induced earthquake rate changes in the Brawley Seismic Zone, southern California, Bull. Seismol. Soc. Am., 106, doi: 10.1785/0120150053. Petersen, Mark D.; Mueller, Charles S.; Moschetti, Morgan P.; Hoover, Susan M.; Llenos, Andrea L.; Ellsworth, William L.; Michael, Andrew J.; Rubinstein, Justin L.; McGarr, Arthur F.; Rukstales, Kenneth S.
Petersen, M.D., Mueller, C.S., Moschetti, M.P., Hoover, S.M., Llenos, A.L., Ellsworth, W.L., Michael, A.J., Rubinstein, J.L., McGarr, A.F., and Rukstales, K.S., 2016, 2016 One-year seismic hazard forecast for the Central and Eastern United States from induced and natural earthquakes: U.S. Geological Survey Open-File Report 2016–1035, 52 p., http://dx.doi.org/10.3133/ofr20161035. Petersen, Mark D.; Mueller, Charles S.; Moschetti, Morgan P.; Hoover, Susan M.; Rubinstein, Justin L.; Llenos, Andrea L.; Michael, Andrew J.; Ellsworth, William L.; McGarr, Arthur F.; Holland, Austin A.; Anderson, John G.
Petersen, M.D., Mueller, C.S., Moschetti, M.P., Hoover, S.M., Rubinstein, J.L., Llenos, A.L., Michael, A.J., Ellsworth, W.L., McGarr, A.F., Holland, A.A., and Anderson, J.G., 2015, Incorporating induced seismicity in the 2014 United States National Seismic Hazard Model—Results of 2014 workshop and sensitivity studies: U.S. Geological Survey Open-File Report 2015–1070, 69 p., http://dx.doi.org/10.3113/ofr20151070. 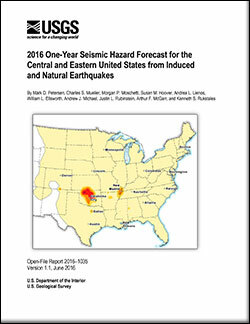 Modeling earthquake rate changes in Oklahoma and Arkansas: possible signatures of induced seismicity; 2013; Article; Journal; Bulletin of the Seismological Society of America; Llenos, Andrea L.; Michael, Andrew J.
Ji, Kang Hyeun; Herring, Thomas A.; Llenos, Andrea L.
Near real-time monitoring of volcanic surface deformation from GPS measurements at Long Valley Caldera, California; 2013; Article; Journal; Geophysical Research Letters; Ji, Kang Hyeun; Herring, Thomas A.; Llenos, Andrea L.